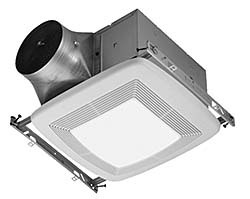 Model SP-80 and SP-110 ceiling exhaust fans use EC motor technology. Low CFM setting allows for precision adjustment to prevent over-ventilating. Adjustable time delay can be used to run fan on high speed for a set amount of time before returning to a continuous lower speed. Performance ranges from 30-110 cfm and up to .6 inches wg. Can be used in new or retrofit applications such as restrooms, offices, and storage/janitorial rooms.